This is a dilemma most home buyers have to face. On one hand, they have their dream property right in front of their eyes and on the other; they have the ignominy of a long commute. But before discussing the long and short of this, what defines a long commute. Is it a 30 minutes drive, a 45 minutes exercise, an hour and a half gruel? The time needs to be factored in. Also, if one is commuting for that long, you need to calculate the returns you are getting while doing so. The ideal question should have been, is it worthwhile? Now, money is and will forever be a finite instrument. Just like life and time. So how much of it would you be spending in the car, stuck in traffic and not being happy about it at all? Perhaps nothing at all. However, let’s look at the other possibilities. Your workplace, even though at a great distance from your new home, pays you well. It pays you to afford a great house, bills that you need to pay each month, education for your child et al. If that is the kind of job you are currently in, the journey is worth the while. Also, the title did mention a perfect house. Now that would mean, it did fit your budget more admirably than the other ones which you had checked out. The advice would be stick to it. Both your job and your perfect house matter and what links both of them is the paycheck you receive every month. Of course, if either one is suspect, then you have to start looking for newer possibilities. If it is not and I presume it surely is not, a commute should not be the deciding factor. Certain other things to look out for. Is the new house, which seems perfect to you, in a good school district, provided you are a couple. Even if you are not, the future needs to be factored in. Statistics show that while the average commuting time has remained unchanged at 25.5 minutes those traveling for more than an hour rose to 11.1 million in 2012. Now that is a rise of 300000 from 2011. Hence, idea is to strike a balance and it greatly boils down to priorities and find the perfect mix. Buying a home for the first time can be both an overwhelming as well challenging task. You have so many things to consider while buying a property that you will call home for the rest of your life. Young couples often face the daunting task of deciding on a house that fits their pocket as well as aspirations. Thus, it is imperative to do a little financial homework before you can actually get down to some legwork. Check your credit score – To qualify for a loan, your credit score is going to play the most vital role. Every bank follows very strict loan approval criteria when it comes to credit scores. You will have to check your credit report for unpaid accounts or collection accounts or mistakes and rectify anything that can adversely affect your credit score. If you have a damaged credit score then you will have to invest some money and time to get it rectified. You need to keep in mind that only a good credit score will make you eligible for a loan. Weighing your assets and liabilities – First time homebuyers need to weigh their assets and liabilities. They must be aware of the amount of money they draw in and the money that they actually owe. This will give them a clear picture regarding the money that they will need after buying a house. Arrange the documents – You will need documents at every stage of home buying, so be ready with documents like two recent pay slips, tax returns, last two month’s bank statement etc. Buying a home is a time consuming process but when you are ready with the documents, consider one third of the job done. Find out whether you qualify – You will need to find out whether you actually quality for a housing loan or not. For these you can ask the bank officials and find out the amount of money you will need to repay the loans and the exact amount of loan you qualify for. Determine the down payment – You will have to get in touch of your bank and find out the exact down payment that you shall have to make. This again can be determined from the loan amount and the time period for which you wish to take the loan. Most of the people today are busy spending more time contemplating about the future hobbies, adventures, and travels that they would do during retirement. This is also the reason why they are saving and investing as early as today to support the lifestyle that they are envisioning when they already decided to stop working. However, there is one question that remains in their minds, “Will I ever be able to retire?”. Even though they already have a vision of what is waiting for them in the future, there is still this hint of uncertainty. This is normal. Of course, we can never be so sure of the future, right? Read on and find the answer to your question about retirement. Understand Your Income Sources – Understand what is your income source when you are already retired. Are you depending on annuities, pensions, Social Security, distributions, or your own retirement savings? If you have savings, know if you can convert them into income stream or investment account. Save More Often – Your savings play a big role in your retirement. It is actually the top consideration during retirement because it is the amount that you can surely use when you stop working. You can use your savings to invest in anything that you would like to do when you reach the age of 60 and up. If you are saving now, save more often. It would really be great help on your retirement. The answer to the question “Will I ever be able to retire?” will always depend on how you work on it before the time comes. Retirement is not something that people should ignore. It is hard to work and earn money. You would no want your effort to come to waste in the end. As early as now, do something to remove the uncertainty in you. The above mentioned are tips on how you can guarantee your retirement soon. Doing these tips will significantly determine your future lifestyle and status when you reach the age of your retirement. TSP or Thrift Savings Plan comes under the 401k plan of the U.S. federal government. In terms of participant account and investment balance, TSP is the largest among all 401k-like plans. In this article, we are going to find out whether TSP is actually suitable for your portfolio or not. However, in order to determine this, we will need to dig deeper and find out the pros and cons of this savings plan while also finding out some strategies to include TSP in your portfolio. Under the retirement plans of US federal employees, TSP forms an important one besides Social Security and The Federal Employees Retirement System (pension). Both the military as well as the civilian employees of the federal government are eligible for this contribution plan. Both traditional as well as the Roth accounts are offered by TSP. The five L funds along with the other six core funds have an expense ratio of 0.029%, which is $2.90 on an investment of $10,000. Thus, TSP maintains the lowest expense ratios for the mutual funds. Wise selection of funds – Core funds of TSP include C fund, S fund, I fund, F fund and G fund which cover majority of the asset classes. Lifecycle funds – The five core funds are maintained in different percentages that matches the Lifecycle of Thrift Savings Plan. Covers your entire life – Even when you separate from the federal service, you can still keep the account active while including any retirement plans into TSP. Civilian receive an agency match – The civilians coming under the purview of FERS retirement system are entitled to receiving an agency match. Withdrawal Limits – You will be entitled to only a single partial withdrawal prior to giving you the opportunity to withdraw the entire fund. Thus, there are many people who move to the IRAs post retirement. No conversions within the plan – You are not allowed to convert any part of your traditional balances into Roth Balance. I fund is not that great – I fund is considered to be among the weakest of all the five core funds. Thrift Savings Plan is great for the federal employees but is not considered great for others. Thus, if your financial planning includes TSP then you must weigh your options before putting in your money. What are the Pros and Cons of Home Ownership. Home is where the heart is. So went the adage. It has always been drilled into our brain that growing up and buying a home was the smartest financial move ever. In fact, buying a home was and is considered as a very good investment opportunity. Sounds too good to be true, right? Or is it? Let us look at the pros and cons of home ownership. Yale economist and Nobel Prize winner Robert Shiller debates about the feasibility of accepting home buying as an investment. He says, that the returns are just too small and that the premise of real estate appreciation does not always stand true. Calculated over the past 100 years, home prices have grown at a measly rate of 0.3%, after adjusted for inflation. Stocks and bonds have given, over the same period, an annual return of 6.5%. This difference is just big to ignore. Home buying should be kept as just that. An asset to protect you and your family against the vagaries of nature. As an investment vehicle, it simply does not stand up to the other instruments available in the market. What blunder most do is to make up more than 75% of their investment based on the price of their home. There is an inherent risk because of the lack of diversification. Owning a home is an absolute matter of pride. And beyond that, a recognition of all the hard work you have put in to buy that property. It is also a sign of prosperity. Owning a home is an excellent tax saver. The question of equity comes into play. Rent paid is gone forever. It never builds up your financial equity. However, with a mortgage payment, equity is built over a period in time. Owning home lets you beat inflation, even though by a very small percentage. According to Prof. Karl Case, long-term housing did have its moment when it went a wee bit ahead of inflation. Now, if you are young and thinking 30 to 40 years ahead, it is a very valuable insurance against inflation. Not a mean task at all. Contradicting to what I had said in point 1, the house is a risk capital. Again, as mentioned earlier, a home should never be viewed as a way to get rich, because it simply does not work that way. However, equity in a home can always be linked to your portfolio. Home owning does have its fair share of pros and cons. 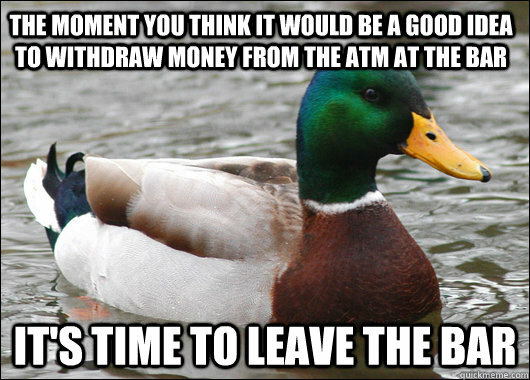 It totally depends on the individual and his or hers financial situations. But as the line goes, “Home sweet home”. 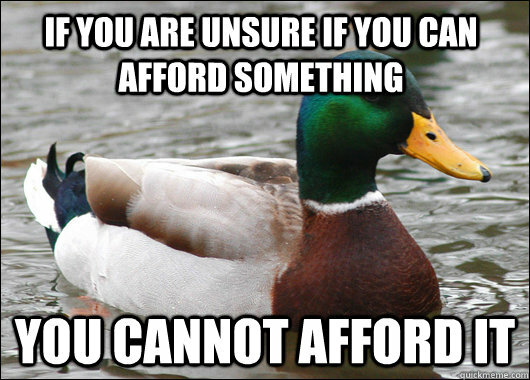 If you are unsure if you can afford something you can not afford it. Simply put if you have ever questioned whether or not you can afford something it is best to not buy it. Instead you should wait one week and see if you still want it. If you still can’t afford it then do not buy it. You do not want to take on debt especially credit card debt if you do not need it.